It may seem like it is ‘recipe contest season’ but that’s only because the Food and Wine Conference has so many wonderful sponsors who are offering fabulous prizes to the winners and I would love to be one of them! I am very aware that as a niche blog, not all contests are ones that I can in good conscience enter. 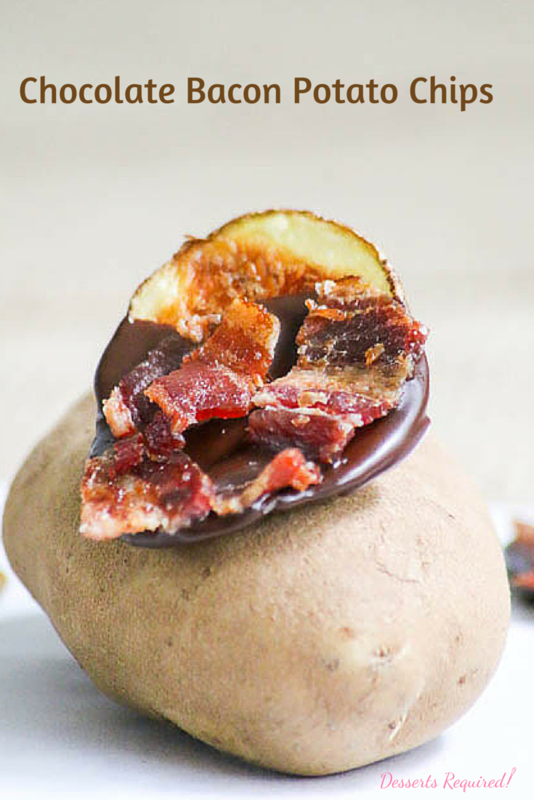 Fortunately for all of us, I knew exactly what I wanted to make with Idaho® potatoes and they are a great fit for Desserts Required, Chocolate Bacon Potato Chips. Not sold yet? 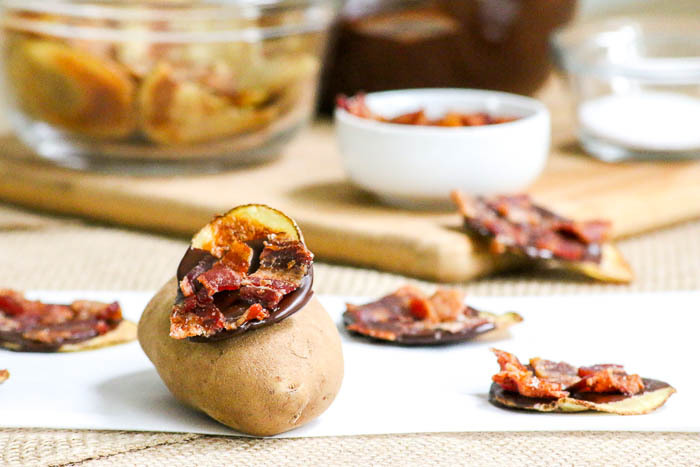 Picture this….homemade potato chips using Idaho® potatoes that are cooled, dipped in deep dark chocolate, sprinkled with sea salt and topped with crisp bacon. Samuel loves the potato chips without the bacon and I could not stop eating the ones with it. Good to know that there is something for everyone. 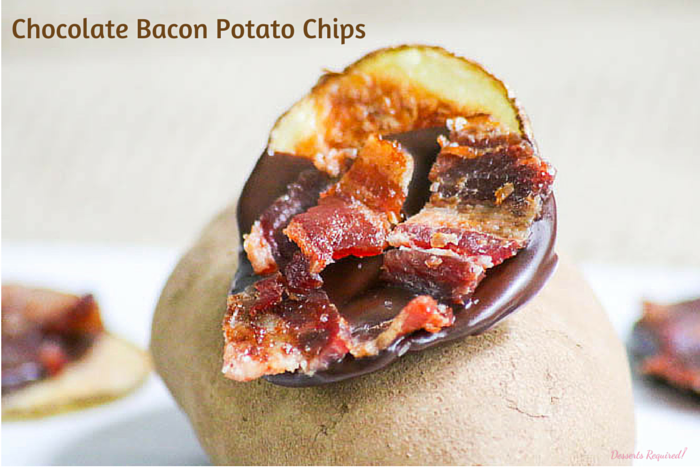 How will my Chocolate Bacon Potato Chips stack up to the competition? We will have to wait to see. There are some very talented bloggers attending this year’s conference. Good thing for you that you don’t have to wait until after the conference to make your own Chocolate Bacon Potato Chips. The recipe can easily be adjusted for a larger crowd or you can keep it small and just enjoy a batch on your own. If you are feeling really nice, then you should share with your family and friends, too. 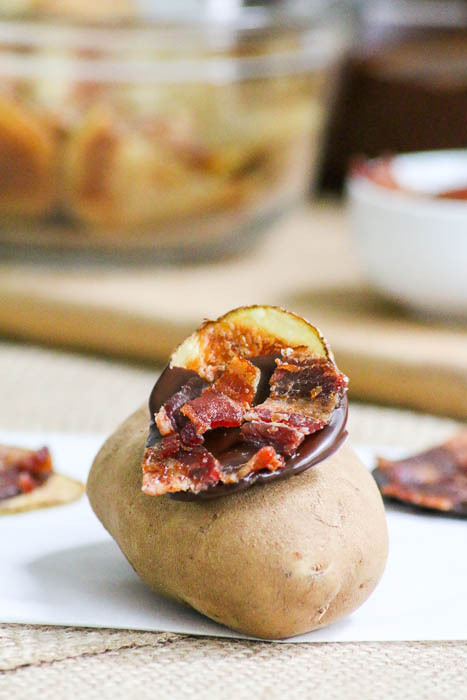 Chocolate Bacon Potato Chips are perfect to share with your family and friends. Preheat the oven to 400°. Slice the potatoes ¼” thick using a mandoline or knife. Transfer the potatoes to a large bowl and toss with the olive oil. Place the potatoes on baking sheets and bake at 400° until the potato chips are cooked and crispy, about 45 -50 minutes. Watch them closely towards the end to make sure that they are not getting too dark. Remove potatoes once they are cooked, taking those off the pans that cook faster than others. Cool completely. Dip each potato chip into the melted chocolate. Sprinkle with sea salt and top with pieces of bacon.